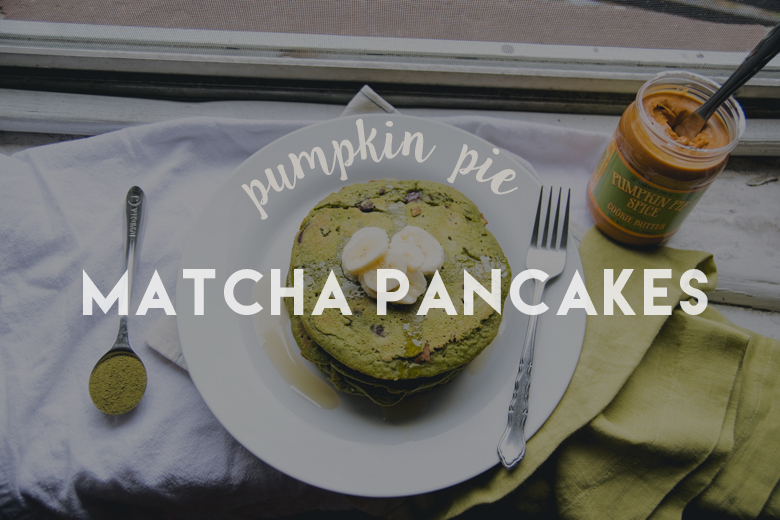 Let’s say you really want to attempt this recipe, but alas, DAVIDsTEA no longer supplies the Pumpkin Pie Matcha, so what do you do? 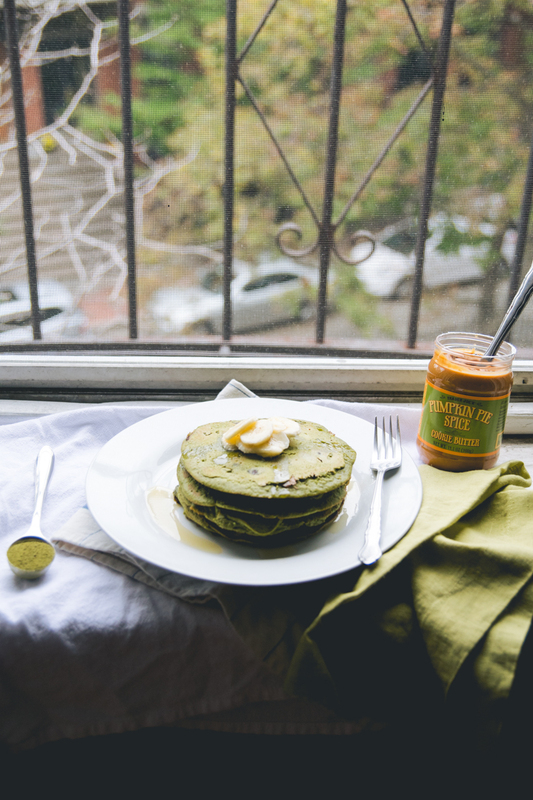 Pretty easy, really: use 1 tablespoon of matcha (lowest grade is fine, you’re making pancakes not celebrating a job promotion) + 1 Tbsp canned pumpkin pie mix. Or you could just use 1 banana + 2 tsp matcha + 1.5 tsp pumpkin pie seasoning. 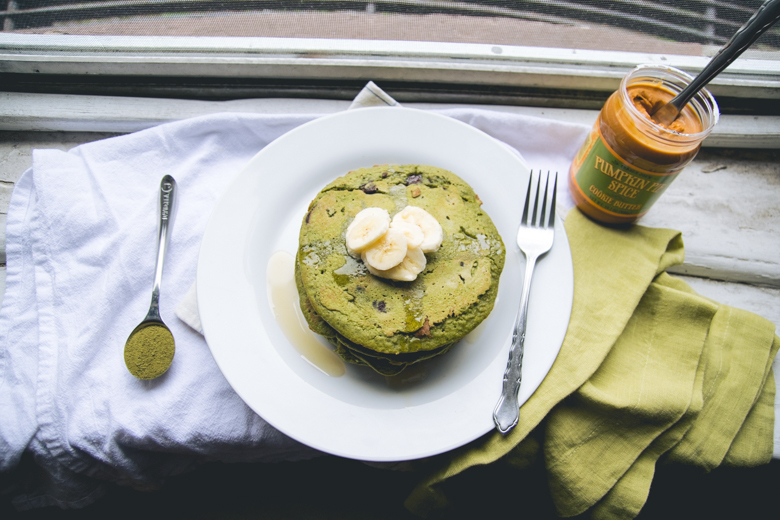 The possibilities are endless with matcha & when you can sneak it into your breakfast, it’s all the better. 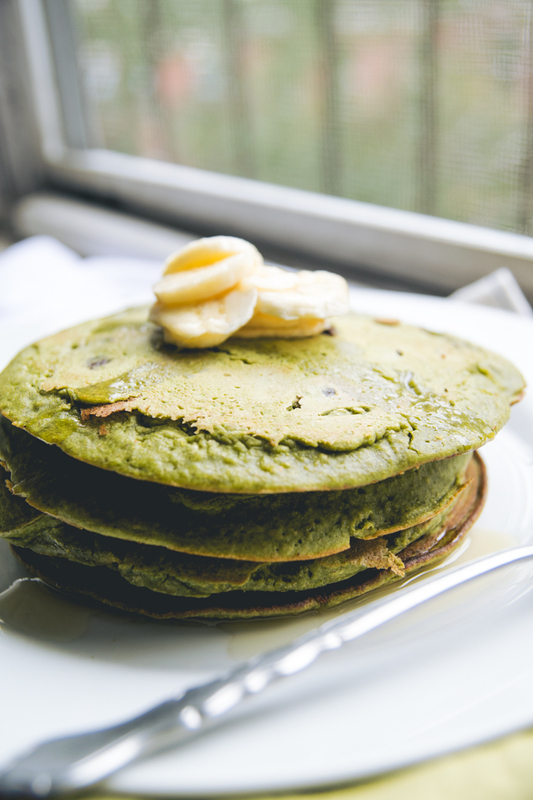 I will not eat green eggs & ham, Sam, but I will definitely be eating some green pancakes. 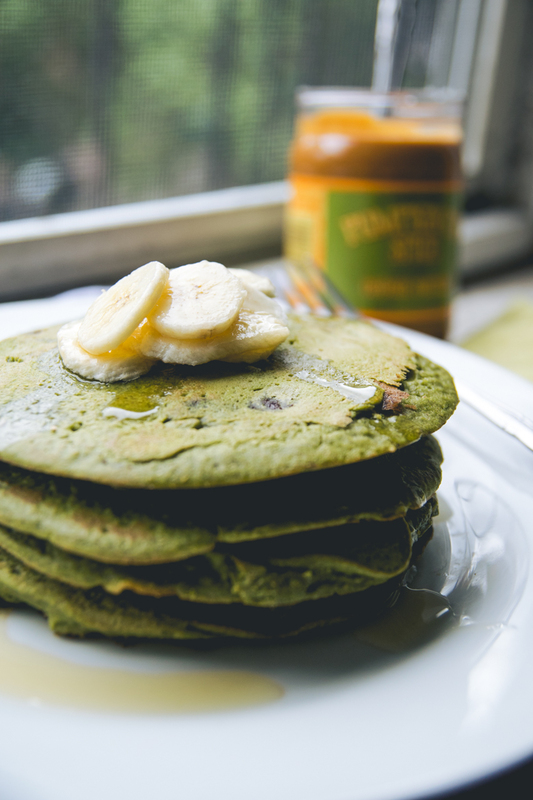 BONUS SUPER FUN TIPS: If you’re not sold on the awesomeness of matcha or you just want to make some green pancakes right meow, try mashing up avocado or stick the eggs + butter + milk in a blender or food processor with some spinach et voilà green pancakes that are healthier than the typical pancake. MMMMMM. 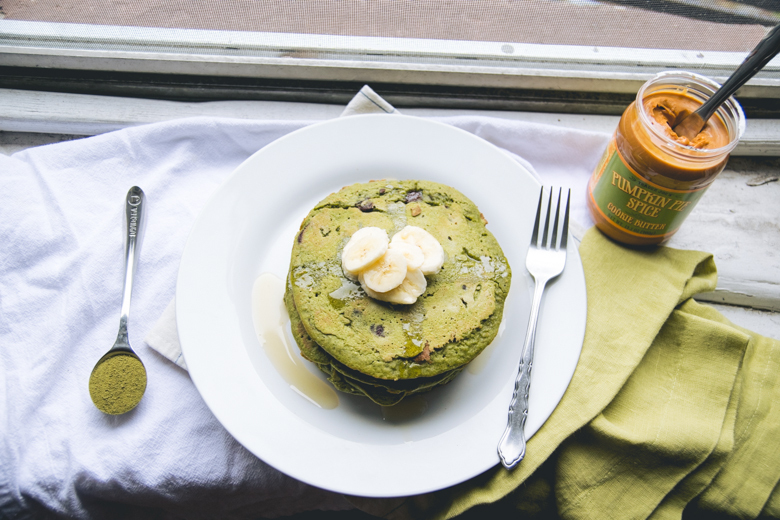 Green pancakes do sound way better than green eggs and ham (ick!). I’m with you that matcha is awesome. I’d got addicted to iced matcha latte lately, and your post is now making me want to drink some more of it. I loveeee me some matcha lattes. I try to drink different tea lattes at work so that I’m no always using my one allotment of lattes on matcha–so I just add a little soy milk to it instead. Definitely get your hands on some matcha yourself so you can make your own! Plus, it’s healthier. & also, you can stick it in pancakes :D! I love matcha! I actually work for a matcha company that’s getting pretty big… (it’s called Encha, in case you were wondering lol). I actually had no idea you could bake with it, because I’ve never seen food items besides ice cream/mochi until I started working there. You should try matcha waffles! They’re so good! My boss made them for me a couple months ago & I’ve been craving them since! Yumummmuuuuummm! I LOVE matcha! Whenever I’m back in Japan, I love to eat and drink matcha everything! Especially any sweet matcha desserts. 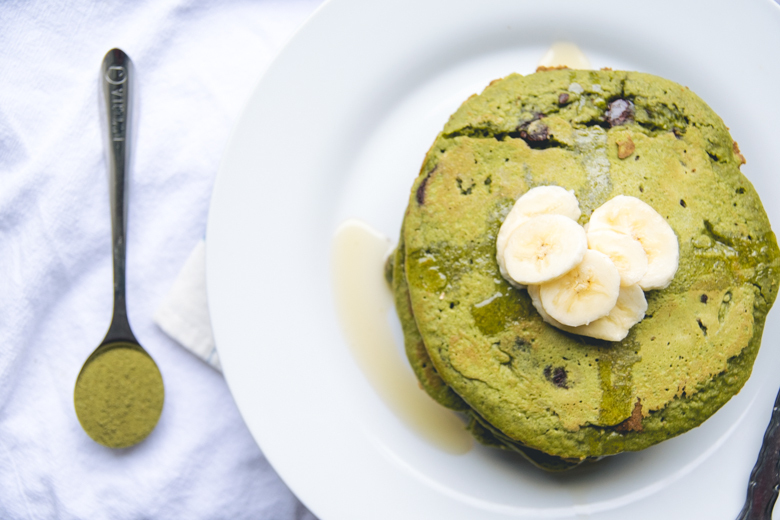 But I don’t buy it a lot in Australia because it’s a bit expensive but I think I might just have to so I can make these, they look so yummy and I’ve never had matcha pancakes before! I love Dragonwell! 🙂 Seriously get your hands on some matcha from DavidsTea. Every order comes with 3 samples of loose leaf tea, so you really can’t go wrong. I’d recommend Matsu for cooking since it’s the least expensive of the 3 straight ones DT carries. It’s also less grassy than Ceremonial–which is always amazing to drink, but I feel bad cooking with it because it’s expensive & I would rather just drink it. DT also has 3 different flavored matchas! Super delicious. Adagio also has amazing teas & their prices are solid!